Downey Daily Photos: What would we do without the internet? 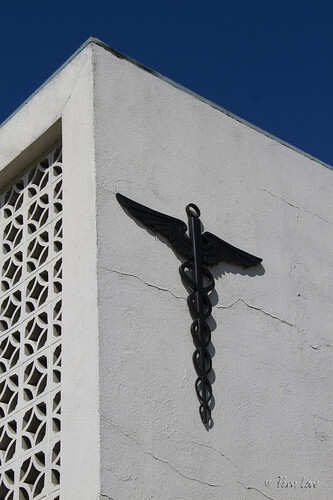 The caduceus has an interesting history as a medical symbol. The caduceus is actually the staff carried by the Greek god Hermes and is a symbol of commerce and negotiation. According to Ask Yahoo!, the U.S. Army medical corps adopted the caduceus as their insignia because of its similarity to the staff carried by Asclepius, the god of medicine. But the staff carried by Asclepius has only one snake and no wings. Asclepius' staff is the emblem of the American Medical Association. If the medical corp had just had the internet, there wouldn't be this mixup.